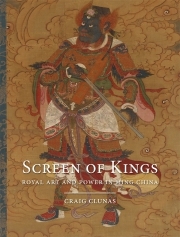 Screen of Kings is the first book in any language to examine the cultural role of the regional aristocracy or ‘kings’ – relatives of the emperors – in Ming dynasty China (1368–1644). Through an investigation of their patronage of architecture, calligraphy, painting and other art forms, and through examination of the contents of their splendid and recently excavated tombs, this innovative study puts the aristocracy back at the heart of accounts of China’s cultural and artistic histories, from which they have until very recently been excluded. To listen to a discussion of Screen of Kings by Craig Clunas and Carla Nappi of www.newbooksineastasianstudies.com please click here.